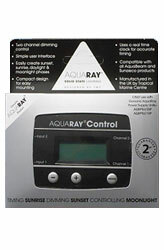 AquaRay Controller comes without a power cord. The power cord from the AquaBeam 600s or AquaBeam 1000/1500/2000 is used to power the controller. A power cord can be ordered separately (Item# 2590). This unit has two inputs so it can control 2 AquaBeam 600 strips or 1 AquaBeam 1000/1500/2000 tile. Easily create sunset, sunrise, daylight & moonlight phases. Compact design for easy mounting. Uses a real time clock for accurate timing. Compatible with all AquaBeam light units including AquaBeam 500/600 and 1000/1500 and GroBeam 500/600 and 1000. 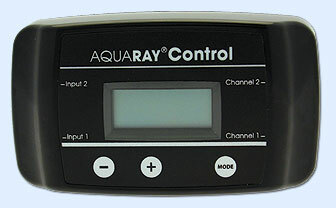 DrTim shows you how to setup an AquaRay LED Controller step by step.